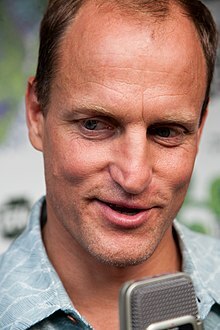 Woodrow Tracy "Woody" Harrelson (born July 23, 1961 in Midland, Texas) is an American actor. He made his movie debut in the 1986 movie Wildcats. Harrelson's father was Charles Voyde Harrelson. He was a contract killer. He was arrested for the killing of Federal Judge John H. Wood, Jr. by rifle fire in 1979 in San Antonio. Harrelson is a vegan. He was on postage stamps issued in 2011 as one of PETA's 20 famous vegetarians. He was named PETA's Sexiest Vegetarian in 2012 (along with Jessica Chastain). He would like the legalization of marijuana and hemp. He is also an environmental activist. Harrelson is a supporter of the 9/11 truth movement. He has supported reopening an investigation into the September 11 terrorist attacks. In 1985, Harrelson married Nancy Simon, daughter of playwright Neil Simon, in Tijuana. The two meant to divorce the following day, but the storefront marriage/divorce parlor was closed when they had returned to it. The two remained married for ten months. On December 28, 2008, Harrelson married Laura Louie, his girlfriend since 1987. The couple have three daughters, Deni Montana (born February 28, 1993), Zoe Giordano (born September 22, 1996), and Makani Ravello (born June 3, 2006). Laura is his former assistant. She is a co-founder of Yoganics, an organic food delivery service. Harrelson was arrested in Columbus, Ohio in 1982 for disorderly conduct. He was found dancing in the middle of the street. He was also charged with resisting arrest after he ran from the police and assault after he hit one of the officers. Harrelson avoided jail time by paying a $390 fine. On June 1, 1996, Harrelson was arrested in Lee County, Kentucky. He symbolically planted four hemp seeds. This was to challenge the state law which did not distinguish between industrial hemp and marijuana. Harrelson was acquitted of these charges in 2000. In 2008, TMZ photographer Josh Levine filed a lawsuit against Harrelson. It was for an alleged attack outside a Hollywood nightclub in 2006. A video of the incident appeared to show Harrelson grabbing a camera and clashing with the photographer. Los Angeles prosecutors would not press charges against the actor. Levine filed a lawsuit asking for $2.5 million in damages. The case was dismissed in April 2010. ↑ Sipchen, Bob (December 20, 1998). "The Life of Woody". Los Angeles Times. ↑ "Woody Harrelson's Father Dies in Prison". CBS News. Associated Press. March 21, 2007. ↑ "Who Doesn't Love Woody Harrelson?". Esquire. Retrieved July 7, 2012. 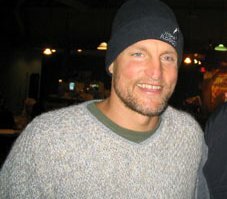 ↑ "Woody Harrelson on the seeds of spirituality and a change in his diet". Premiere. Retrieved July 7, 2012. ↑ Bill Hutchinson,"First-Class Stars' Meat-Free Pitch," NYDailyNews.com November 28, 2011. ↑ Jessica Chastain and Woody Harrelson Named PETA's 2012 Sexiest Vegetarians - E! Online. Retrieved July 1, 2012. ↑ "Woody Harrelson". hollywood.com. 2007. Archived from the original on January 25, 2013. Retrieved September 9, 2007. ↑ 9.0 9.1 "Crime/Punishment". About.com. ↑ "Woody Harrelson arrested in London". BBC News. June 7, 2002. ↑ "Harrelson taxi case dropped". CNN. July 1, 2002. ↑ Alan Duke, CNN (April 10, 2009). "Woody Harrelson claims he mistook photographer for zombie". ↑ "Paparazzo's Lawsuit Against Actor Woody Harrelson Dismissed". April 17, 2010. ↑ David Robert (November 18, 2011). "Woody Harrelson Talks 'Hunger Games". MTV. Retrieved December 30, 2011. This page was last changed on 6 June 2018, at 05:03.